In late October 2015, Southeast Asian imported coriander has caused an outbreak of Shigellosis in Sweden. The severity of this outbreak had caused forty reported illnesses in three areas (twenty-nine from Vastra Gotaland, ten from Skane, and three from Halland). There was the same proportion of adult male and female who had fallen ill and no reported deaths. Shigellosis is an acute bacterial infection caused by a group of Shigella bacteria. It is linked with “poor sanitation, contaminated food and water, and crowded living conditions”(Vyas, et al., 2014). Some symptoms include acute abdominal cramping, fever, bloody stools, watery diarrhea, and nausea (Vyas, et al., 2014). The severity of Shigellosis is mild as healthy individuals are able to surpass this illness with no chronic issues. However, the severity increases for malnourished children and immune-compromised individuals. Coriander is a type of herb commonly used to complement a variety of foods and recipes as it adds a spicy flavor component that many find appealing. Therefore, it is commonly found in restaurant dishes where, in this case, has been the likely source of the illnesses reported in Vastra Gotaland and Skane. The Public Health Agency of Sweden had interviewed the people who were sick as part of their outbreak investigation and had found that there was a connection between different restaurants. In addition to interviewing those who were sick, the Public Health agency of Sweden used “Whole-Genome Sequencing of the Shigella bacteria from the people who fell ill after visiting different restaurants” (Whitworth, 2015). Whole-genome sequencing is a type of molecular subtyping method used to reveal the complete genome of an organism in order to identify pathogens isolated from food samples (FDA, 2015). First, a sample is taken from a patient and is then cultivated in order to isolate bacterial DNA. After, the bacterial DNA found in the specimen becomes processed using an automated bench-top sequencing system. In other words, the bacterial DNA becomes processed in order to determine the order of nucleotides within its genome. Finally, this information can then be analyzed and compared to central data storage of known DNA bacterial sequences, in this case is the Shigella bacteria (Wang, Lecture Slide 18, 2015). As a result from implementing a whole genome sequencing method, the Public Health Agency of Sweden did not detect the Shigella bacteria in any samples that were taken. Although the samples taken of the people ill showed close to identical bacterial strains, which suggests that their illness had most likely came from a common source. 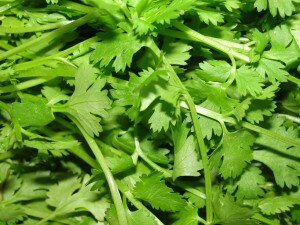 In addition, the coriander could not have been analyzed as it had disappeared from the marketplace before the outbreak became known. However, upon interviewing the people who were ill, it has been determined that coriander had been a common denominator found in the restaurant meals. This analysis has leaded the Public Health Agency of Sweden to conclude that the source of illness is the imported coriander from Southeast Asia. This outbreak is a great example of the level of difficulty it is to find the cause of an outbreak when the cause is most likely an ingredient in a meal. Because the whole-genome sequencing indicate negative results for the presence of Shigellosis raises a lot of questions for the conclusions made by the Public Health Agency of Sweden. However, through their findings it is highly likely that the cause of the outbreak is from the coriander, but it is yet to be determined whether the illness is, indeed, Shigellosis. In order to ensure that similar outbreaks like this do not occur again, more stringent policies can be implemented to ensure that imported produce has come from the cleanest foreign companies. Discussion Question: From what we have learned in class about the outbreak investigation method in Canada, would you agree with the Public Health Agency of Sweden to conclude that the source of illness had come from the Coriander? If not, what methods could they have further done to accurately determine the source of the Shigellosis bacteria? The conclusion made by the Public Health Agency of Sweden seems to me to be based on guesswork rather than hard data. The article reports that analysis of the coriander samples showed no positive results for the pathogen, however the outbreak was still attributed to that same batch of produce! This reminds me of the case with Spanish cucumber and fenugreek seeds from Egypt that was discussed in class. I think more investigation is needed to attribute the illness to one specific food, based on scientific findings. If no evidence emerges, then the case could be reported as unresolved, similar to numerous outbreaks in Canada. It is also very interesting to know that despite using the most comprehensive and advanced method available (Whole Genome Sequencing), these complications may arise in practice! That would be so hard for the company who exported to products cause they might be exporting products to many other countries and might forced them to recall the products and the outbreak might not even be because of their products. But the Public Health Agency of Sweden should have make another hypotheses because their data results did not supported their original hypotheses and shouldn’t conclude their investigation based on guesses. That would not be fair for the company who exported the coriander. I wonder why the Public Health Agency of Sweden used whole genome sequencing as their first and only investigation method though, because WGS is the most expensive one. Since WGS is the one with highest discriminatory power, I think instead of using new methods, the agency can test for more samples and see if they were able to find positive samples. If not, then probably coriander is not the real cause of food-borne illnesses? I like how your blog links to the process outbreak investigation that we’ve learnt in class. I personally think that the Public Health Agency of Sweden should not conclude that the coriander originated from South East Asia is the source of the outbreak. This is because no samples of the coriander were tests, which means they have no evidence to suggest that the coriander contains the strains of Shigella that matches with the infected patients. However, as mentioned in the blog, the suspect coriander can no longer be found in the market. From this I’ve learnt that it is a struggle that a real outbreak investigation could encounter. I agree with above comment that the Public Health Agency of Sweden should not have concluded the outbreak of coriander to be originated from South East Asia. Although it is a very likely source of the outbreak, without enough data to evidently state the outbreak cause, it should not have confirmed its case. If it wasn’t from the coriander from South East Asia, it will put the farmers into extra steps and cost that were not necessary if the investigation included further research. Also, this would put the farmers of South East Asia with bad reputation which they are not responsible for. From the article, I realized how it is very hard to trace back food sources for contamination and that preventing it from happening in the first place is the best strategy.